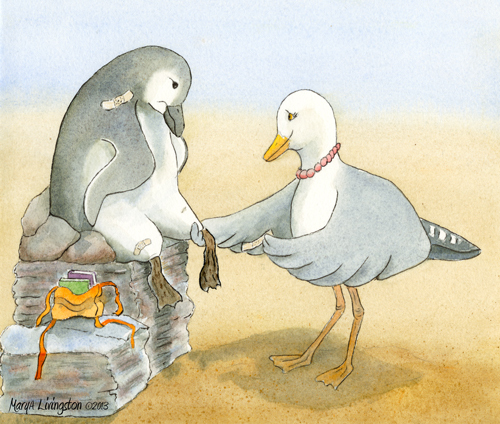 This entry was posted in Art, Awards, Bliss Tips, Children's Writing, Picture Books, Uncategorized, Watercolor and tagged Children's Books, Inspiration, MaryA Livingston, penguin, seagull by MaryALivingston. Bookmark the permalink. I can tell we’re in for a real treat. Thanks. Fantastic Mary! 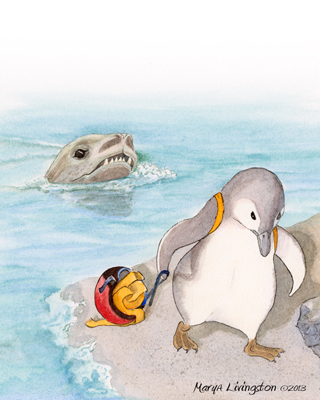 I’ve fallen for Percy – can’t wait to see more. You definitely have his motions, the research was well worth it, plus being in San Francisco isn’t a bad place for a project! Simply lovely! Percy is quite loveable!! Thanks for sharing Percy. He’s absolutely adorable! My environments of bliss are sitting in my kayak on the ocean or a quiet river OR sketching alone in a quiet park. But investing time in talking and playing with my kids (even though hard at times when selfishness draws me towards the first two I mentioned) trumps all.